Primrose Squarp simply knows her parents did not perish at sea during a terrible storm, but try convincing the other residents of Coal Harbour on that score. For all practical purposes, at least for the time being, Primrose is an orphan, and there's no great clamoring of prospective adopters. After realizing the impracticality of continuing to pay Miss Perfidy (a mothball-scented elderly lady) an hourly wage to baby-sit her, the town council is able to locate a relative, Uncle Jack, who reluctantly takes Primrose into his care. Primrose does warm up to living with him and in his home, despite the eerie noises resembling a hockey game that haunt her in the night. But true sanctuary can always be found at a restaurant called The Girl in the Swing, where everything--including lasagna--is served on a waffle, and where the proprietor, Miss Bowzer, offers a willing ear, as well as sage advice. Through a mixture of eccentric humor and probing philosophy, author Polly Horvath makes Primrose's search for peace and understanding a most memorable one. 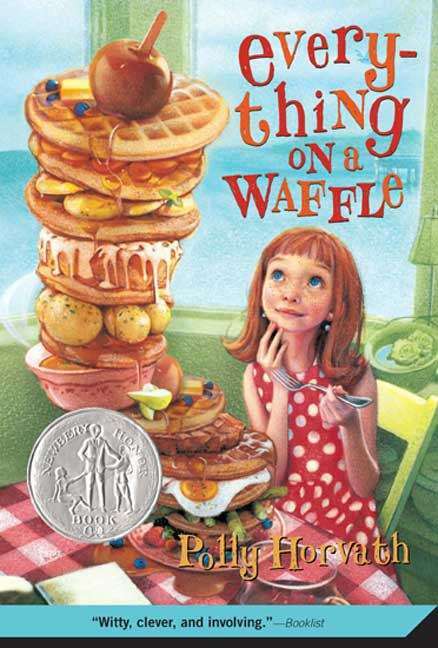 Everything on a Waffle is a 2001 Boston Globe - Horn Book Award Honor Book for Fiction and Poetry and a 2002 Newbery Honor Book.